The Junior Triathlon is a wonderful opportunity for kids 5-10 years old to try out the sport in a fun environment. By popular demand, we’ve opened the field this year to accommodate more kids. Junior’s also receive a Finisher Medal and T-Shirt. This event is for children 5 to 10 years old who are comfortable with basic running, bicycling, and swimming skills. It is a super opportunity for beginners. *There is also a youth triathlon category for children 11-18 years old. This is the same distance as the adult triathlon. WHAT SHOULD MY CHILD WEAR/BRING? Less is more in triathlon! The less stuff to change in and out of the better. It is recommended that children wear a bathing suit under their run/bike shorts and shirt (there are no changing rooms!). They will likely wear the same sneakers for the run, bike, and the transition to the pool. They MUST have a helmet for the bike ride. No exceptions! You’ll also want a towel and a change of clothes for post-tri. We will have a water table in the transition area available at all times. There will be snacks and water at the finish festival. WHAT TIME DOES IT START/ARE THERE WAVES? All children should be set up in the kids transition and ready for a pre-race talk from the Race Director at 10:25am. The children will be separated into groups of about 25 kids based on their age on 12/31/19 as per USAT rules. Waves are as follows: 9-10 years, 7-8 years, 5-6 years. Waves will start oldest to youngest with the first group starting at 10:45am and approximately 10- 15 minutes between waves. 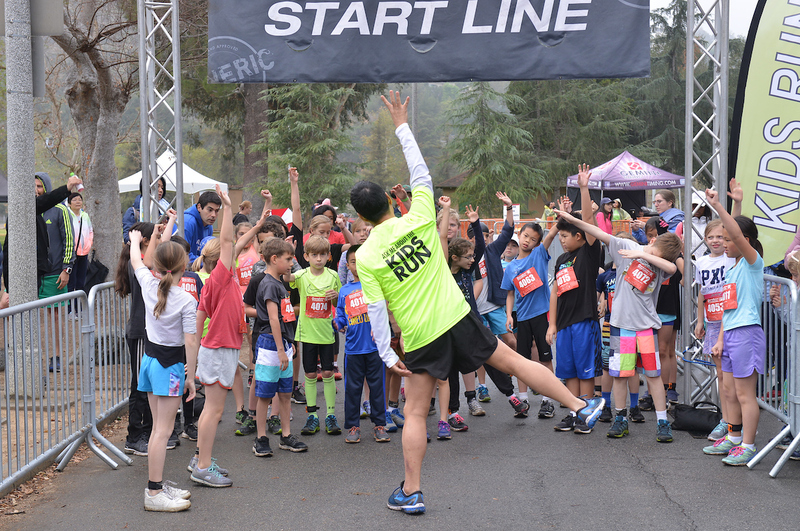 Timing of the wave starts is intended to help keep the children safe by easing congestion on the course and is at the discretion of the kids race coordinator. CAN PARENTS BE ON THE COURSE WITH THE KIDS? Parents are welcome to come and support their young triathletes from the sidelines but may NOT be on the course. We have created a course that will keep the kids “close to home” so there are plenty of opportunities for photos and to help out your child if they need it. There will be volunteers and signage, as well as lead runners and lifeguards guiding the children and helping them if they need it. Parents of 5-6 year olds may run alongside very young triathlete in wave 3 only, but please limit this to one adult per child. (please run/walk only, no adults on bikes please). You may also be on deck when your child is in the pool. IS IT TIMED/ARE THEIR AWARDS? WHERE IS THE TRANSITION AREA? The kids transition area, which is located near the 5k finish line (look for the green KIDS ZONE flags), will open at 7:00am so bikes/gear may be dropped off beginning then. Please ensure bikes are properly marked with race stickers from the packet you will receive at check in. You will need your child’s bib to enter transition and to remove bikes at the end of the event. All children should be set up in the kids transition and ready for a pre-race talk from the Race Director at 10:25am. To avoid overcrowding, only one adult per child is allowed in the transition area at any time. There will be volunteers to help with set up. THE RUN COURSE: Kids will run out and back along a closed road, the course is about 1/2 mile on road and a dirt trail behind Kidspace museum. THE BIKE COURSE: From transition, young athletes will head onto a coned lane to Seco that will be closed off to traffic. The bike course is about 3/4 of a mile and includes a loop around the median. Parents may watch from the sidewalk as their children circle past them for three fabulous photo ops. Adults are asked to stay off the course for the safety of the children. NO CHILD WILL BE ALLOWED TO PARTICIPATE WITHOUT A HELMET. After the bike loop, cyclists will head back to transition to prepare for the pool swim. THE SWIM COURSE: From the transition area, athletes will run a short distance on the grass to the Rose Bowl Aquatic Center (shoes may be worn until they hit the deck). They will swim out and back (25m each way). When they exit the pool they are finished and will receive a medal! Younger children will swim across the pool one time, 25m. Yes, floaties are ok for this group only.